A mustard seed… “Jesus, I think that’s honestly all I’ve had this week.” In the midst of trials it is so easy to forget the power our faith holds and throw away that power that lives within us into the hands of the deceiver. I am blessed. I am called. I am chosen. I am loved. I have been given a spirit of truth and power, not of fear. I have been given rest, not stress. All of my needs have been supplied. Knowledge is good to have but if it isn’t ever put into practice, how useful is it? Let me tell you it’s not useful at all. My start to study abroad has been hard, frustrating, and has included daily changes and challenges. Nothing has gone as planned since my departure, and week three of having no routine had me ready to bag the experience and come home. (Don’t let me neglect that there have been fun times too), but I feel the need to have somewhat of a routine to my life. After feeling defeated each day throughout the week, I went home and spent time repeating the knowledge of the faith I knew I had somewhere within me to only lose the battle again the next day. I was forgetting the most vital component to faith: “Do what it says.” I let my emotions take control, instead of taking advantage of the power of my little mustard seed. Thursday January 24, 2019 I choose from the moment I woke up that I was going to have a day of hope. I used my knowledge of faith and made the decision that I was going to believe those truths no matter what obstacle the day would bring. I feel renewed with expectation for the Lord to reveal Himself to me, His purpose for me, and His joy for me as I embrace each day as a new opportunity. 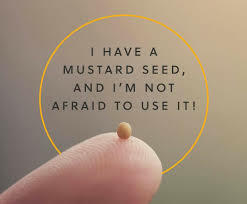 I don’t know a whole lot yet about what this semester is going to entail, but I know that I have to take things one day at a time (sometimes minute by minute), and use my mustard seed.